Hello and welcome to the 192nd instalment of the SWD. The Syrian Democratic Forces have discovered an ISIS vehicle and a large number of explosives belonging to the terrorist group in Raqqa city. Later at night, SDF advanced in Raqqa city during a night operation and took control of an ISIS hospital used to treat injured fighters. 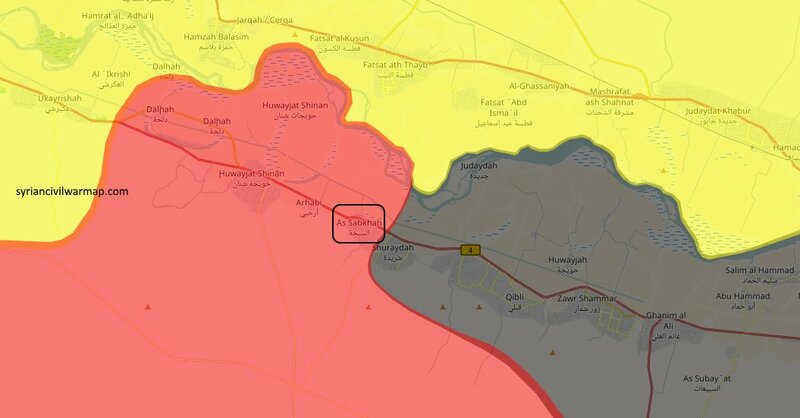 The situation in the southern Euphrates areas of Raqqa governorate remains unclear as both ISIS and SAA claim to control the different villages along the Euphrates river. It’s possible that ISIS still holds the territories as no official source has uploaded images or videos. Meanwhile, SAA casualties have increased as some sources claim that a total 60 SAA soldiers were killed yesterday. Late reports from pro-ISIS sources announce that the terrorist organization’s forces have captured Sabkhah village. Although, this information is not confirmed. The Hay’at Tahrir al-Sham senior leader “Abu Jaber Shaykh” said the group is ready to dissolve itself in order to help and support all the military factions to operate under one command in Idlib. Although, some conditions were made in order to dissolve. The three mentioned conditions are: firstly, the formation of a local civil administration in each city that will be responsible for managing its humanitarian and civil daily affairs; secondly, no military factions on its different administrations; and thirdly, the conversion of all armed fighters into an Official Police Forces to ensure the maintenance and security in the cities. The plan of the terrorist organisation is to merge all Idlib groups under a unique command. Although the plans try to unify the opposition, this is not the first time HTS states something like this and ends up doing the opposite actions, like attacking other groups. Some examples are the constant fights between opposition groups and HTS in East Ghouta. The Syrian Arab Army and allies captured the city of Salba in east Salamiyah countryside. Later today government forces captured Mas’adah, Mukaymin ash Shamali, and Tall Albawi. These newly captured areas, apparently, have encircled a group of ISIS-held territory located between the newly liberated villages, and the already SAA-held areas south of Ithriya-Salamiyah highway. 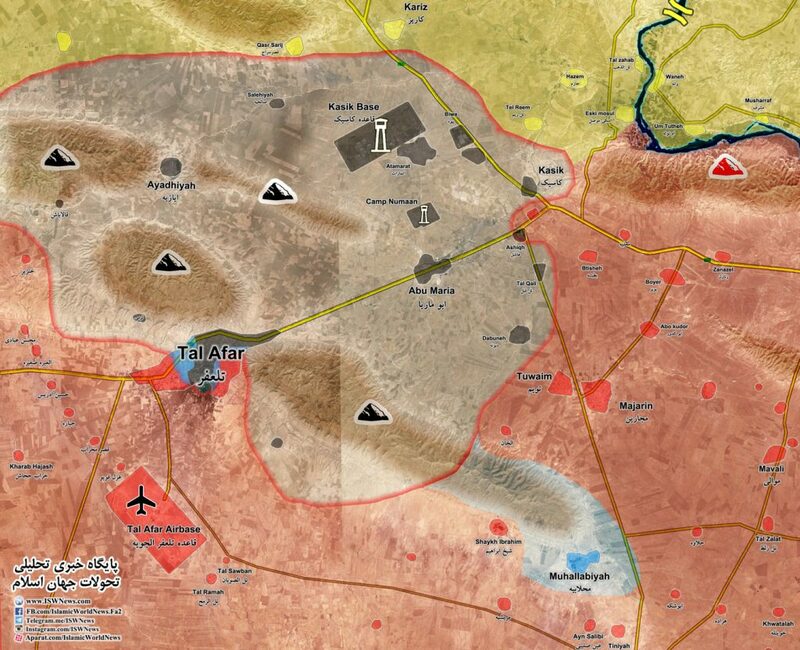 Although the situation there remains unclear, it’s possible that ISIS retreated from the areas to avoid being fully surrounded. Uqayribat is 9 kilometres away from SAA’s current front lines. 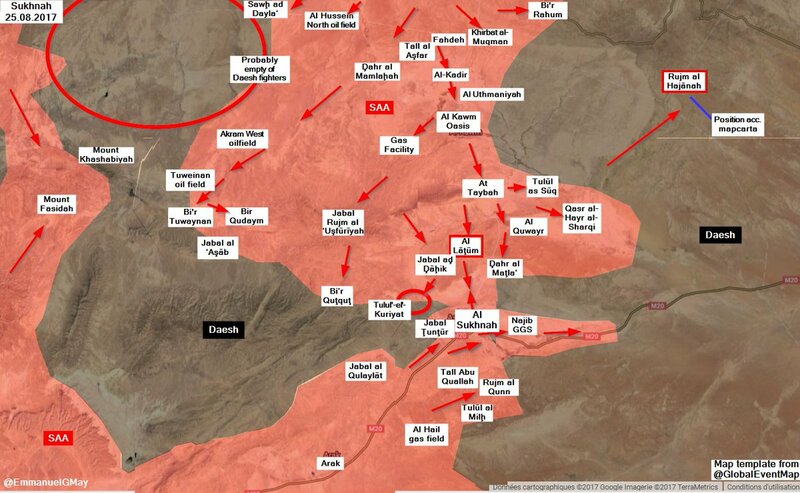 The SAA and its allies took control of Dhahr al-Marla’, Abu Qullah Valley, Al-Ruhayba Valley, Tlul Al-Kuriyat, and Al-Dhahiq mountains. This confirms that government forces pushing from the Ithriyah front have met the government forces pushing from Sukhnah area. ISIS forces are besieged in an area of 2.000 square km. This advances covered the western flank of Tiger Forces which, since its back flank is secured, can securely push towards Deir ez-Zor. Additionally, SAA forces will push from Al-Hir palace, which was captured a couple of days ago. Government forces supported by Hezbollah militias captured several sites and border areas from ISIS terrorists. The operation to retake the Syrian-Lebanese border have, so far, successfully retook the majority of the previous ISIS pocket. ISIS only holds 40 square kilometres of territory in Syria and 20 square kilometres in Lebanon. 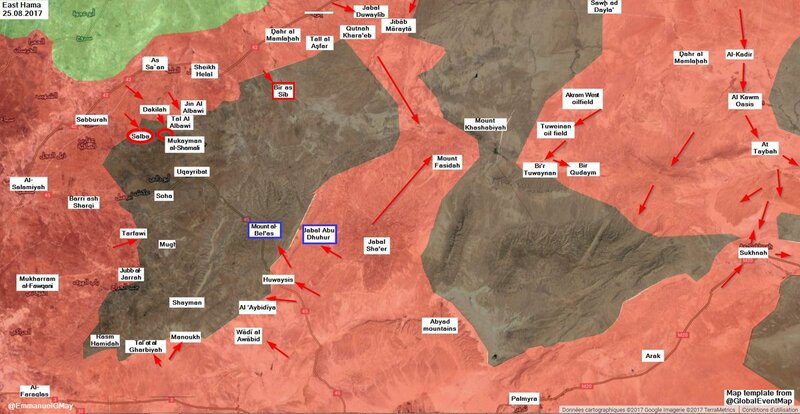 Up to 100 ISIS militants have surrendered to SAA and Hezbollah at the “Romiyyat” crossing in West Qalamoun. So far, lots of ISIS militants have surrendered to Syrian authorities and Hezbollah militants since the operation begun a few days ago. Government forces captured 200 square kilometres today. Additionally, the 5th corps have captured Tell Waityah, Watid Hill and Dahrat al-Arid, both areas located close to the Jordanian border (20 kilometres away from the border). Meanwhile, opposition sources claim that their forces have taken out a Syrian government tank in the southeastern Damascus desert. The Iraqi Operation to retake Tal Afar pocket from ISIS entered its sixth day. Today’s Iraqi forces advances took control of the strategic village of Mahlabiyah. Approximately the 50% of Tal Afar has been liberated from ISIS. On the 24th of August 2017, CJTF-OIR has conducted 10 strikes in Syria. CJTF-OIR‘s main focus in Syria is Raqqa region where they did five strikes supporting SDF‘s operations against IS destroying five fighting positions. Other areas where five strikes occurred are Abu Kamal, Al Shadaddi and Deir ez-Zor destroying two ISIS well-heads, a VBIED factory, a fighting position, an explosives cache, and an ISIS-held building. The full report on CJTF-OIR strikes conducted in both Syria & Iraq can be found here. Another great briefing – many thanks.